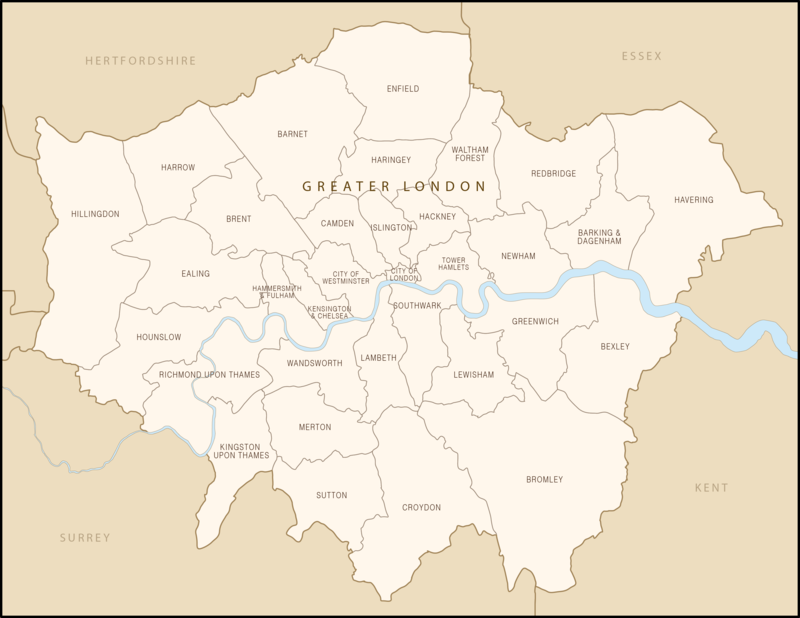 The 33 London boroughs are shown with their names and boundaries on this popular editable vector map base. Vector paths have been carefully drawn so you can highlight individual boroughs with different fill colours as well as showing their boundaries. Each borough fits exactly with its neighbours even at extreme zoom levels. Use Illustrator or SVG editing software to customise the map colours and other details to your own needs. The River Thames is the boundary for many of London’s boroughs. We have plotted the Thames on a separate layer so you have the option to show its path through London if you want – either above or below the boundary lines for the boroughs either side of it – or to hide the layer if you don’t want to show the river at all. The surrounding counties are included for context. You can easily shade these in a different colour or hide them. If you’re looking for a more detailed map, go to the map of Greater London districts, which has this same base for the London boroughs plus hundreds of towns and suburbs, and arterial routes plotted. Want the London postcode districts too? You need the map of Greater London postcode districts plus boroughs and major roads.